Victoria Sweet spent more than 20 years as a physician at San Francisco's Laguna Honda Hospital, tending to some of the city's sickest, poorest residents. 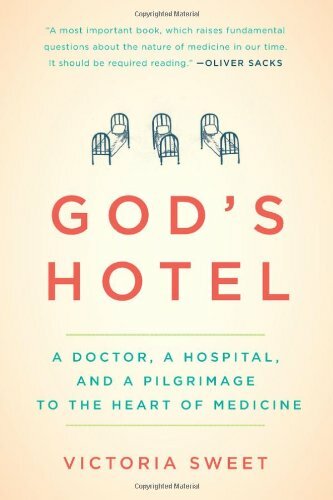 The first thing to know about God's Hotel, her elegant account of her "journey to the heart of medicine" over those years, is her affection for her patients. She introduces each with a tender character sketch—we meet Mr. Essem through his "round young face, his round ears, and his round, attentive brown eyes" and Mr. Tom through his shy, childlike smile "with eyes crinkling down at the corners." But there's another character Sweet is even more interested in understanding: the old hospital itself, a 19th-century estate planted on a hillside overlooking the Pacific. With its Romanesque turrets, arches, and open windows, Laguna Honda recalled the origins of the Western hospital—the medieval nuns and monks who cared for the sick poor as part of their religious duty. With vegetable gardens, occasional chickens wandering the wards, and the ability to take long-term patients discharged from the city's emergency care centers, the hospital also served as the last of the almshouses that once housed America's sick poor, often located on farms at the edges of towns. Sweet follows these echoes back through time, tracking the development of Western medicine and uncovering surprisingly holistic origins. By braiding these historical searches with her time at Laguna Honda, she arrives at a compelling critique of modernized health care and a vision for transforming it. We meet Sweet as she conducts her first autopsy after medical school, sorting through tissue and organs and finding she has no language for the something she feels should lie at the center of the body, "like what you find at the center of a baseball when you unroll it." She realizes she has landed in a profession from which "words like spiritus and animus had been banished."